The city sitting on the Euphrates has been under ISIS control since 2014 when the anti-Governmental protests began to escalate and al-Baghdadi’s Al-Qaeda in Iraq wanted to take advantage of the power vacuum created at the oil rich territory near the Iraqi border. The emissaries sent by Al-Baghdadi formed the Syrian al-Qaeda franchise Jabhat al-Nusra, recently rebranded as Jabath al-Fateh, led by al-Golani. With the franchise formed, the “mother-group” from Iraq separated from the main Al-Qaeda command and established its own mainstream terror group as ISIS. With this terroristic beaurocratic situation, al-Nusra and the new established ISIS began a series of clashes from which the later gained more notoriety and human resources from the earlier. The city of Raqqa was captured after the clashes between Governmental Forces and Rebels created a power vacuum, later won but unsuccessfully managed by the later. The Governmental Forces then made tactical retreats, not only from Raqqa, but from other regions as Palmyra too, in order to concentrate on protecting Damascus, Latakia and Tartus – the hardline Loyalists zones. Damascus only left behind a weary 17th Divison that was overran by ISIS, whom mysteriously appeared in the vicinity town of Slouk. In a matter of days most of the al-Nusra fighters (Al-Qaeda in Syria) switched to the sides of the black flag wielding group originated and coordinated from Iraq. The Rebels led by the FSA (Free Syrian Army) came under attack suffering many high-level kidnappings, executions and a campaign of terror against them. Some of the FSA defected to ISIS out of fear. But their grip on the city grew when reinforcements came from Iraq, that contained Humvee’s and modern equipment left behind by the retreating Iraqi Army, plus hardlined Iraqi insurgents that also served under Saddam Hussein’s government. 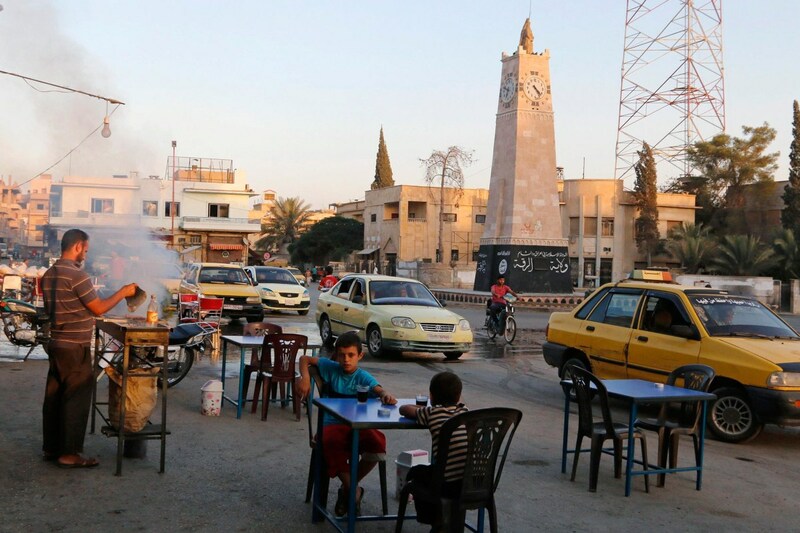 Raqqa covered under a curtain of death and fear, as ISIS began spreading into the whole country, region and the world. They’ve launched a purge on the city’s minorities and destroyed their symbols. For example, the Armenian Catholic Church of the Martyrs was transformed in their headquarters. Inside the city, they’ve tried to build a mirage of governance and public service, establishing courts, a Sharia police and a network of informants that contribute on their terror grip on the city. the Armenian Catholic Church of the Martyrs, now ISIS HQ. Raqqa (Arabic: الرقة‎‎, ar-Raqqah) has been attested since the 7th century when the settlement fell into the hands of Ayadh Bin Ghanim, a prominent military figure of the Rashidun Caliphate and a member of the Quraish tribe, during the time of the Islamic prophet Muhammad. While the city managed to keep its overall Christian population thanks to a treaty signed which permitted the freedom of worship, the growing Islamic Caliphate built in time heavy military complexes that ultimatley expanded Raqqa, merging the city with the bordering al-Rāfiqah. Togheter, the “new Raqqa” became bigger than the Imperial capital of Damascus. But in those times, Raqqa held a strategic position in the region, located on the banks of Euphrates, it was a checkpoint between Palmyra, Damascus, Iraq and Anatolia. In 796 Raqqa became the capital of the Caliphate, but for a short time. After a not so shinning Bedouin dominance, Raqqa surfaced again in historical writing during the 16th century Ottoman period. It served as a custom post for the Euphrates and housed a Janissary detachment, but the city’s importance look diminished as the seat of the eylat was at Ar-Ruhā’. The city revived in the late 19th century with a wave of cotton boost that remained until this day a custom for the region. With a Mosul offensive underway in Iraq, spearheaded by Kurdish Pashmerga, Iraqi Federal Forces and Shi’a militias, the US-led Coalition makes the case of a “double trouble” to jump-start ISIS’s final days: a synchronized simultaneous offensive to include both Raqqa and Mosul. In this way the terror group would have no where to fall back and retreat. As for example repeatedly happen in Anbar this year. The Iraqi campaign pushed to Ramadi, Fallujah, Qayyarah, where deadly sieges would erupt ending with tactical wins by the Iraqis but with heavy damage to the cities while the jihdaists where constantly falling back, until they’ve reached Mosul. From Mosul, their only chance would be Raqqa, with cross-border corridors still opened. The preferred group forces of the US-led Coalition are the Syrian Democratic Forces/ SDF. The group encompasses Arab, Turkmen, Assyriac and Kurdish groups, but are indeed led and mostly made up by YPG fighters (Kurdish group), which comes in a direct contradiction with the strategy of a NATO ally, Turkey, that was launched its own operation into northern Syria to fight ISIS but most of all, to deter and fight-off the Kurdish YPG and PKK. SDF press conference announcing operation “Wrath of Euphrates” in Raqqa. With the SDF officials saying that a deal was struck with the US to keep Turkey, that has been targeting their fighters, out of a Raqqa operation. It’s safe to assume that negotiations are still ongoing between Washington and Ankara regarding this topic, as Erdogan repeatedly said that Turkey will be military involved in any attempt to liberate Raqqa. Turkey was also caught up in a diplomatic confrontation with Baghdad as Ankara wanted to take part in the Mosul operation at the request of the Kurdistan Regional Government, but the central federal government in Baghdad gave a hostile “no-no” after Turkish troops repeatedly violated its territory in the past. With a constant deadlock in Aleppo between Regime and Rebels (FSA and Idlib-based ones), Turkey’s stagnation towards the ISIS-held Al-Bab and the YPG, left without purpose or strength after the Turkish intervention, the Syrian front can be decisively revived by this undertaking. As Raqqa is silently slaughtered by the terror group, one can only hope that diplomatic missteps won’t hold up this operation too much. The offensive is expected to begin as soon as possible as villages in the Governorate are already tackled.